I celebrated my 30th birthday in Bali...in a villa...by myself...and it was heavenly!! I will be doing different posts about my overall experience, but I wanted to highlight one experience in particular. Rachael what is your favourite food?..... erm...Thai..Pan Asian...basically anything from that side of the world!! So it seemed only right to do a cooking class in Bali! One of my life goals is to do a cooking class in every country I visit. I love to cook and I love to eat, so it just makes sense right?! 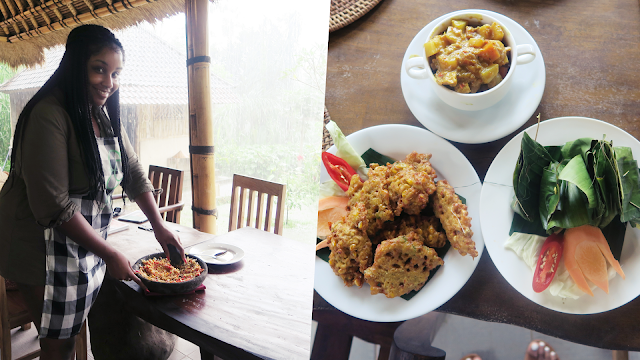 I partnered with Cookly to do a Balinese cooking class at the first farm cooking school in Bali. Cookly brings food lovers and food professionals together to enjoy quality cooking classes. It's like Airbnb,but for foodies: you pick a location, you book a culinary experience and you are to discover a new tasty world! I have been pescartarian for three years so I opted for the vegetarian menu. From eating in different places in Bali, I was excited to cook these dishes because everything I had had was so delicious. Before we stepped into the kitchen we visited the local market to buy ingredients and learn about new foods. The market was colourful and full of different foods, some I have never heard of and some familiar ones that also grow in Barbados (where my family is from) We walked around with the guide learning new fruits and also having a chance to taste some. Once our ingredients had been picked we headed to the organic cooking farm. The farm was so beautiful and just looked fresh. Upon arrival we met our cooking instructors, who explained how the class was going to work and the history behind the farm. We had the chance to tour the farm and pick fresh ingredients to cook with. I learnt so much about the different ingredients and how they grow. With all our ingredients picked, we headed back to the kitchen to start cooking. Excitement!! Check out my vlog below to see how the rest of the cooking class went and also my visit to the local market.